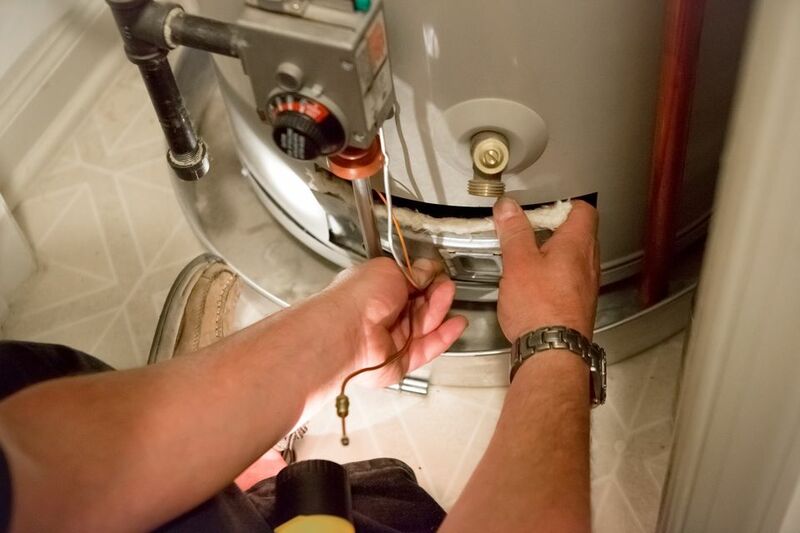 A water heater typically lasts between 8 and 12 years, but only if it is maintained properly. A simple three-step annual maintenance plan will extend the life of the water heater. Electric: Switch off the circuit breaker for the water heater in your home's service panel (breaker box). Gas: Turn the pilot knob (located on the water heater's gas valve/thermostat) to the OFF position. Place a bucket under the drain valve found near the bottom of the water heater tank. Turn the valve counterclockwise to release 1 to 2 gallons of water into the bucket. Some drain valves have a handle, while others have a short stem with a slot for a flathead screwdriver. Warning: The water will be very hot, so take care to avoid burning yourself. Close the valve by turning it clockwise. If the valve won't open, contact a plumber to perform maintenance. The temperature and pressure (T&P) relief valve is a critical safety feature of your water heater. It senses dangerous pressure buildup or excessively high temperature inside the water heater tank and automatically opens to relieve the pressure. Without an operational T&P valve, a water heater is at risk of explosion. Therefore, water heater manufacturers recommend testing the T&P valve once per year. Place a bucket under the end of the discharge tube connected to the T&P valve. Lift up on the lever of the valve to open the valve manually. This will release hot water through the discharge tube and into the bucket. Warning: The water is very hot, so take care to avoid skin contact. Let the water flow for a few seconds, then let go of the lever and allow it to snap back into place, shutting off the water. If the T&P valve does not open and release water,​ or if it leaks after the test, the valve must be replaced. 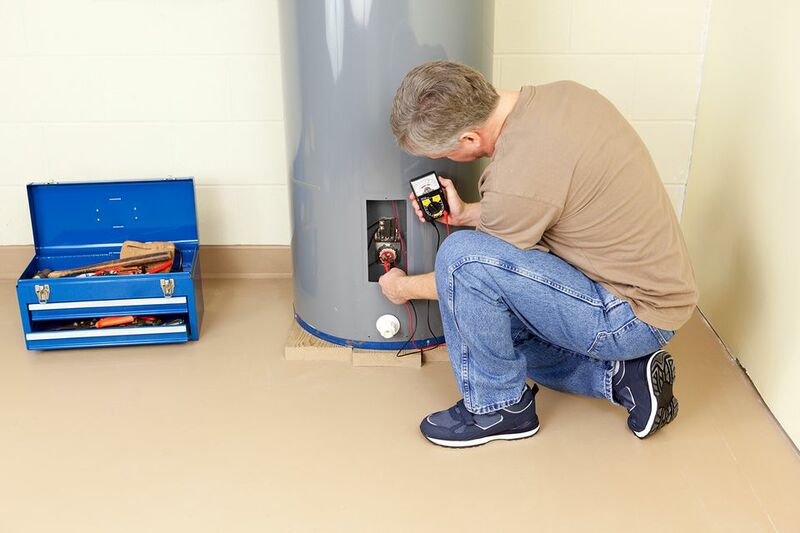 Water heaters are typically installed at a preset temperature of 130 to 140 degrees Fahrenheit. However, the U.S. Department of Energy recommends a setting of 120 F for most households, estimating that this can reduce energy costs for water heating by more than 5 percent. Lower temperatures also reduce the risk of scalding and slow the accumulation of mineral deposits in your water heater tank. To lower the water temperature on a gas water heater, turn the temperature dial on the heater's gas valve to 120 F.
Turn off the power to the water heater by switching off the appropriate breaker in your home's breaker box. Remove the thermostat access panel and adjust the temperature to the desired setting. This might require a flathead screwdriver. Replace the thermostat cover and turn the power back on at the breaker box. Many electric water heaters have both an upper and a lower thermostat. If yours has two, adjust the lower thermostat to the same temperature setting as the upper. How Is a Tank Type Gas Water Heater Designed?